If you experience discomfort or pain in your back, neck and shoulder, it could be caused by poor seating and positioning in your wheelchair. Your back support may be at the wrong angle or your foot rest may be at the wrong height or of the wrong size causing your foot to fall off, thus needing you to frequently re-position yourself. When people feel unstable due to inadequate seating, they are less likely to risk moving to perform daily activities such as reaching for an object or using a computer or bending forward while shopping. 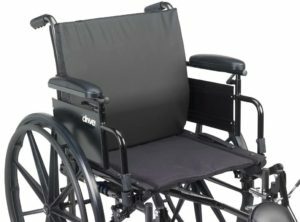 Schedule a seating evaluation with a clinician to take a look at your wheelchair seating. For those users needing more than standard off-the-shelf products, customized seating equipment can be created by seating specialists for better safety, comfort and function. Pressure mapping of your seat and backrest can be done to make it appropriately suited to your body shape. Evaluation: If you have recently had a surgery, your functional ability has changed or you have purchased your wheelchair a long time ago, it may be time to re-evaluate your seating and positioning in your wheelchair. Take an active role in the assessment and be open about your lifestyle, activities and functional goals. Tell your clinician what feels and what does not feel comfortable in your wheelchair. Also remember that what feels comfortable immediately may not feel so after 30 minutes. So ask to try a wheelchair for a half an hour before finalizing options. Cushioning and Support: Cushions come in a wide range of materials, shape, sizes and degree of firmness. Choose one that feels good for you while sitting and moving around. The lumbar area is the little space in the back that curves inwards. If it does not get adequate support, the entire back will feel painful. A lumbar support or even a small rolled up towel can make a world of a difference for your back. A little extra cushion on your arm rest can make you feel extra comfortable especially if you use them to transfer or re-position yourself. Lateral side supports are a great addition if you have low torso control and balance issues. They can help support you if you lean too far to the right or left and allow you to keep your balance. Additional head support will be required for those patients whose head control is low or declining. Poor head control can impact breathing and feeding so it is important to support the head if independent control is difficult. Adjust the footrest and armrest: Most wheelchair users do not realize how much their foot position affects their overall posture and comfort level. The ideal position to be comfortable in a wheelchair is to have your knees slightly higher than your hips. Knees that are too high or too low can cause discomfort to your back. The height of the arm rest also plays an important role in proper alignment of the person’s shoulders. Re-positioning: Simple body movements can make a lot of difference in sitting comfortable on the wheelchair. Most wheelchair users find crossing their legs to be an effective way to relieve back pain. Be sure to switch the legs often to avoid pressure sores. Some self-re-positioning movements can be carried out by the wheelchair user themselves or with the assistance of their carers or nurses. The lift-off movement is where the seated person pushes up from the armrest of the chair to take the buttocks completely off the support surface. If you have good trunk control, you can roll or move from side to side and lift the buttock completely from the cushion to encourage tissue reperfusion at the lifted side. The height and position of the arm rests are important to carry out this movement safely. If you can stand and bear weight, you should stand for short periods with the necessary support. Recline the backrest: It can be difficult to keep your posture straight the whole day and can cause users to lean forward. When you are not in motion, recline your backrest a few degrees to make your seating more comfortable. A tilt in space option allows a person to adjust their position throughout the day. Comfortable Clothing: Clothing must be comfortable and must be easy to dress and undress. Adaptive clothing are designed to be easy to wear and do not require the person to stand up from the wheelchair. Avoid bulky clothes and closures or buttons at areas of the body that have contact with the wheelchair as they can cause pressure sores. If you need a blanket, consider getting one that fits in the lap and straps behind the lower legs to prevent getting it tangled in the wheels. Your wheelchair is your source of independence and should provide you with support, comfort and mobility. The input of an occupational therapist or seating specialist can properly guide you on the long term requirements and your changing needs.